Iraq has called for an international treaty banning depleted uranium (DU) weapons in a report to the United Nations as evidence continues to mount of their risks to civilians. Iraq’s report, published ahead of this autumn’s UN General Assembly where DU weapons will be debated, also urges member states and UN agencies to adopt a proactive approach to the issue and condemn the use of the weapons. Iraq is the country most affected by wartime DU contamination, with at least 400,000kg used by the US and UK in 1991 and 2003’s conflicts. The International Coalition to Ban Uranium Weapons (ICBUW) has also called for DU weapons to be banned, just as anti-personnel landmines and cluster bombs have been. ICBUW argues that the weapons are inherently indiscriminate and that their legacy persists long after the end of conflict. 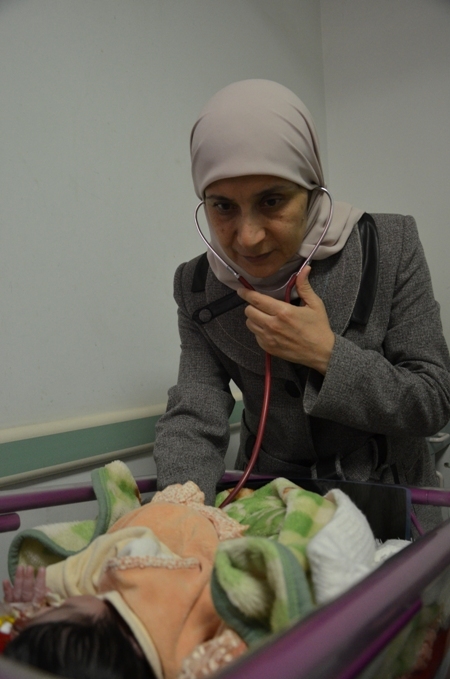 Dr Samira Alani, who has worked at Fallujah General Hospital since 1997, has been documenting cases of congenital birth defects at the hospital since 2006, when a sharp increase in rates led her to begin recording data on the developing health crisis. Credit: Donna Mulhearn. Fallujah paediatrician Dr Samira Alaani has launched a Change.org petition calling for official data on rates of congenital birth defects in Iraq to be submitted for peer review in the open-access journal PLoS One after repeated publication delays by the World Health Organisation and Iraqi government (Petition is available here: www.change.org/act4iraq). Results from the nationwide study, undertaken by the Iraqi Ministry of Health (MoH) and the World Health Organisation (WHO) in 2012, are now long overdue. Iraqi researchers interviewed by the BBC earlier this year claimed it will link increased incidence rates of birth defects with areas subject to heavy fighting in the 2003 war – a hugely significant and politically sensitive conclusion. Dr Alaani is calling for the data to be submitted to the leading open-access journal PloS One after persistent delays from the WHO and MoH in the analysis of the data. Publication in PLoS One would allow independent scrutiny of the data and reduce fears that the WHO’s internal process had been subject to politicisation because of the controversial nature of the study. The research was prompted by concerns from maternity hospitals across Iraq that rates of congenital birth defects were unusually high. This is the first time that rates have been recorded and analysed nationwide. To mark the 10th anniversary of the 2003 invasion, a new report has highlighted continuing uncertainties over the impact and legacy of the use of 400 tonnes of depleted uranium (DU) weapons in Iraq. The report reveals the extent of DU’s use in civilian areas for the first time. In a State of Uncertainty published by Dutch peace organisation IKV Pax Christi, has sought to do what the US has so far refused to do – reveal how widely the weapons were used in Iraq, and in what circumstances. It also analyses the costs and technical burdens associated with DU use, arguing that a decade on, many contamination problems remain unresolved – leaving civilians at risk of chronic DU exposure. 4 minute documentary filmed and directed by Dearbhla Glynn, with the support of Afri, outlines some issues posed by use of the Depleted Uranium Weapons. It brings us to Basrah, Southern Iraq, where much of destruction was caused during Gulf War in 1991. 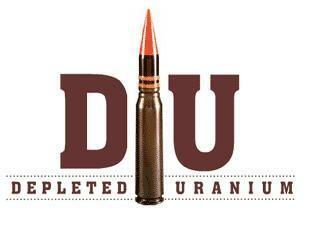 The ammunition used during the Gulf War contained DU. Depleted uranium is a waste product of the uranium enrichment process, used in the manufacture of nuclear weapons and nuclear reactor fuel. Once exposed it stays in the environment for up to 400 million years. DU becomes internalized through inhalation, ingestion and contact with the skin. Alpha radiation inside the body is the most potent carcinogenic agent known to science – twenty times more damaging than x-rays or gamma rays, causing cancerous diseases, congenital anomalies and malignancies. DU use is not an issue known or spoken about outside of the military, and there is very little understanding of it or consequences of using the DU weapons. There are short interviews with Dr. Hamdan, Dean of Basrah Medical school, Dr. Hassan, Head of Oncology, Laura Bush Hospital, Dennis Haliday, former UN humanitarian coordinator, outlining some of these issue in the documentary. Doug Weir, Coordinator of the International Campaign to Ban Uranium Weapons, will visit Dublin on Wednesday 28th September and will speak about the importance of banning depleted uranium weapons in a public meeting organised by Afri on the 28th September in the Central Hotel at 7.30pm. The United Nations First Committee has voted, by an overwhelming margin, for state users of depleted uranium weapons to release data on where the weapons have been used to governments of states affected by their use. Public Meeting: Buswells Hotel, Tuesday 4 May 2010, 7.30pm. Former Staff Sergeant Jimmy Massey, who entered Iraq as part of the initial invasion force in March 2003, and Doug Weir of the International Coalition to Ban Uranium Weapons will speak at a public meeting organised by Afri in Dublin on Tuesday, May 4th at 7.30pm. Afri was one of the many NGOs which supported the International Campaign to Ban Landmines, which eventually succeeded in achieving its goal when an international treaty banning landmines entered into force in March 1999. In 2008 Afri became actively involved in the Campaign to ban Cluster Munitions, which also reached a successful conclusion, achieving a treaty to ban the use, deployment or stockpiling of Cluster Munitions, at the Dublin Diplomatic Conference in Croke Park in May 2008.